Observations of the dark cloud SDC 335.579-0.292 using the Atacama Large Millimeter/submillimeter array (ALMA) have given astronomers the best view yet of a monster star in the process of forming, as seen in this stunning space wallpaper. Observations of the dark cloud SDC 335.579-0.292 using the Atacama Large Millimeter/submillimeter array (ALMA) have given astronomers the best view yet of a monster star in the process of forming, as seen in this stunning space wallpaper. 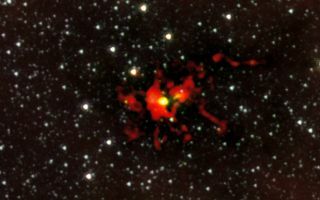 A stellar womb with more than 500 times the mass than the Sun has been found and appears as the yellow blob near the center of this picture. This is the largest ever seen in the Milky Way—and it is still growing. The embryonic star within is hungrily feeding on the material that is racing inwards. It is expected to give birth to a very brilliant star with up to 100 times the mass of the Sun. This image was released July 10, 2013.